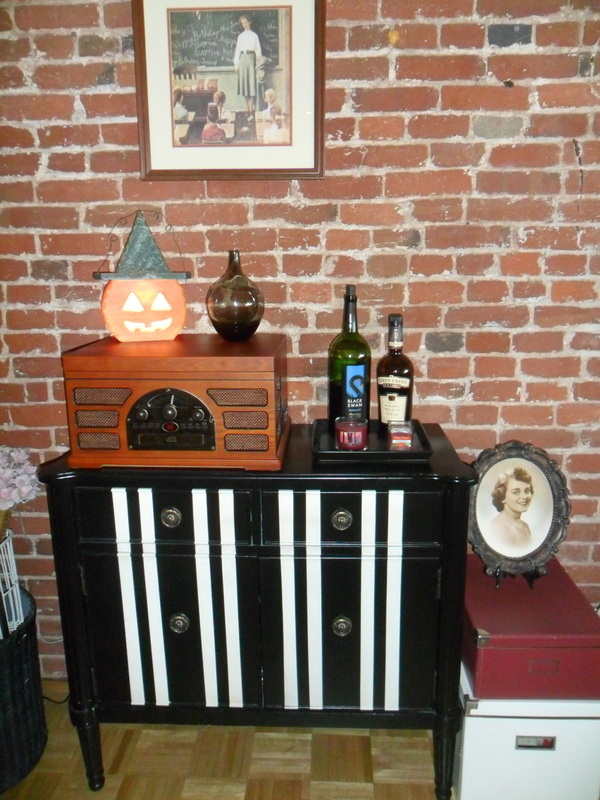 Last week, I finally got all of the Halloween decorations up. I also had to rearrange our furniture because Olivia started walking! We wanted to create a confined space for her to play where we can all hang out. 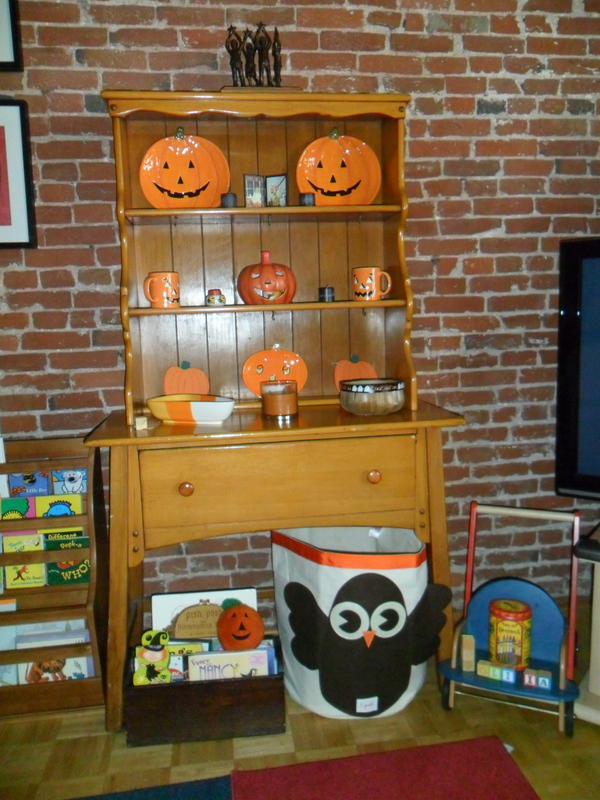 I moved this piece of furniture to where our bar used to be and put Olivia’s Owl Canvas Toy bag (from The Container Store) underneath it. She can get to it easily, pull it out, and all the toys that are in it! The small wooden box is where I put holiday / seasonal books for her. 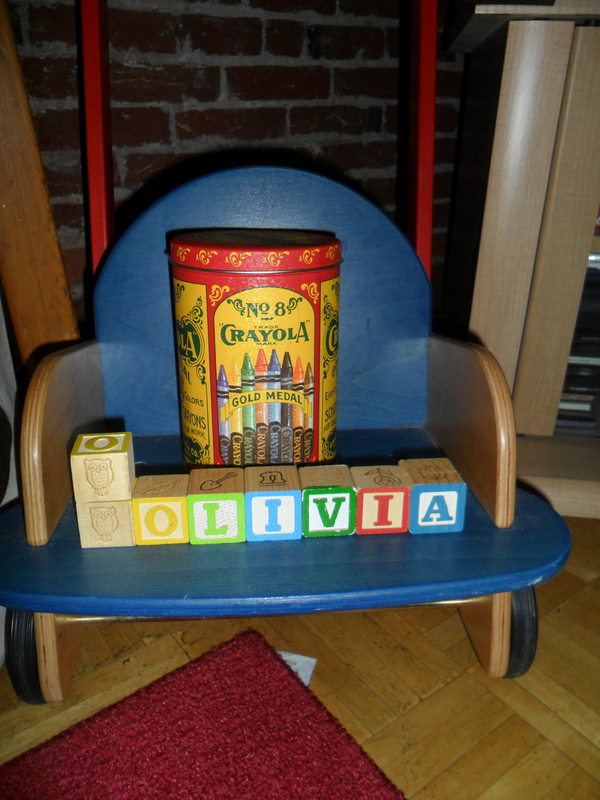 This cute wooden pushcart is a hand-me-down from her cousin Lilly. The Crayola tin (mine from growing up) has all her crayons in it. The trunk used to be flush against the wall…now it’s a blockade! The orange pumpkin holds her blocks. 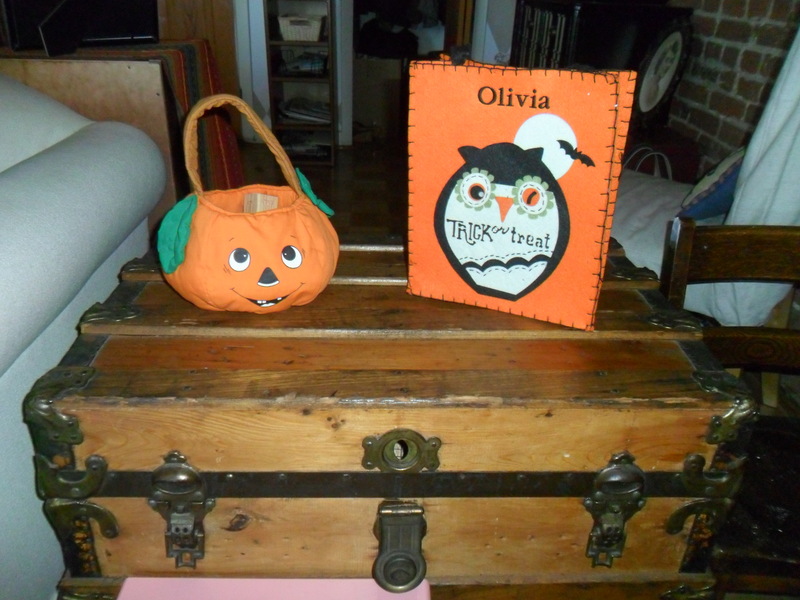 The Olivia Trick-or-Treat bag is from Pottery Barn Kids. For those of you keeping score, yes, I picked it as My Friday Favorites two weeks ago. 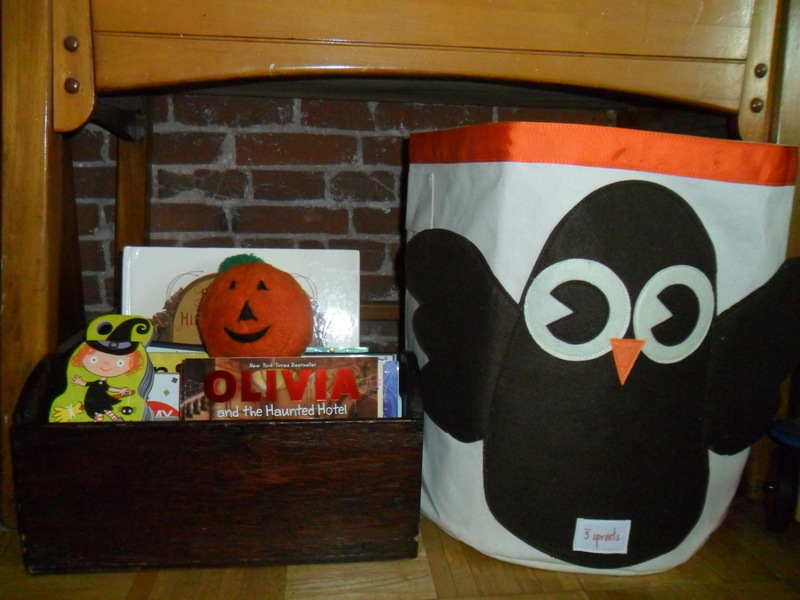 Of course, I had to get Olivia the owl one! Here is the bar (from Pier One Imports.) It used to be in the living area. But Olivia loved to tug on the doors, so we knew it was time to move it! As you can see, it’s not a piece of furniture you want your toddler to get into. 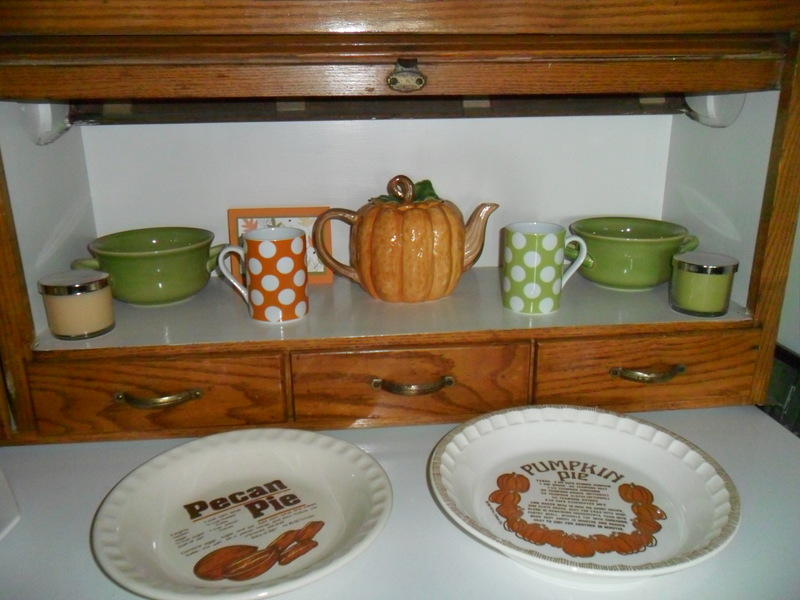 Even our kitchen hoosier cabinet is decorated for fall. Now Olivia has an area all blocked off with her toys and I can sit and watch her while sipping a warm drink and enjoying the autumn season! I hope you all had a great weekend! 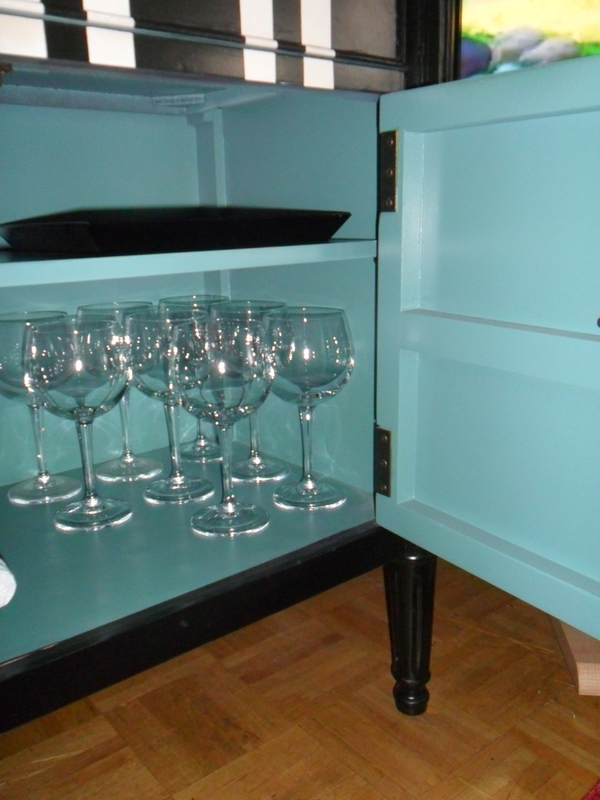 We had a great dinner party Saturday night. I’ll be posting the recipes from the menu throughout the week. Congrats to my faithful reader, Maria, for making the 300th comment. I will be sending out her prize shortly and posting what it is. Have a great week and thanks for reading! Congratulations to Olivia on her new skill-walking!!! How exciting for her, and how tough for you but I love the way you came up with an area for her while still keeping your home, your home. So many people put away all of their things and turn their homes into their child;s play house. Looking forward to my prize! Maureen, Love the owl tote bag. We actually got that for Olivia for Xmas!! I should have known you’d have seen and bought it first! Maybe she needs two?? she certainly has enough toys to fill two!!! It is so cute – we wouldn’t mind two at all! thanks! !